The Founder of Big Water's Edge, Greg Knab, is a San Diego local and has fished extensively along the west coast. He began kayak fishing in 1993 and has been advocating the sport ever since. Corey Wyrick has been working with Big Water's Edge since 2002. He contributes as Vice President of Operations and Marketing, video host and a great fisherman. Andy "Iceman" Allen is our message board moderator and offers a wealth of knowledge about kayak fishing. Often you will find his articles in popular fishing publications. 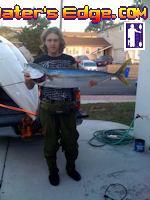 Brian Long graduated from inshore float tubing in the Santa Barbara area to San Diego kayak fishing in 2003. Brian offers kayak fishing classes through OEX, has written articles and does most of the installation for OEX Point Loma. Adi is the president of the Big Water's Edge spam sanitation department. He keeps our message board running smooth and also happens to be a hell of a kayak fisherman.